Thank you to all who came out to see Pumpkin Theater’s world premiere of Little Red! For all information on future programming check out our facebook page. Thanks again to all for being part of Pumpkin Theatre’s 50th anniversary! Have a great summer! Little Red was written by Linda Chambers and directed by Raine Bode. Lighting design by Lillie Kahkonen. Costumes, props and scenic design by Wil Crowther. The Little Red cast includes: Sofia Alvarez, Nick Dimitriades, Donna Fox, Joan Weber, & Dana Whipkey. Scenic construction by Trevor Winter. Performed at Single Carrot Theatre with Peter Pan scenic design by Doug Johnson. SOFIA ALVAREZ (Little Red) Sofia is excited to be back at Pumpkin Theatre. She also performs with the Children’s Playhouse of MD and CCBC’s Cockpit in Court and is a member of the Pumpkin Seeds. WIL CROWTHER (Scenic/Costume/Properties Design) Design credits include costumes for The National Theatre of Weimar, Axis Theatre, The Bowman Ensemble,Theatre Hopkins, Towson University , The Baltimore Shakespeare Festival, Stevenson University and Pumpkin Theatre. NICK DIMITRIADES (Little Wolf) Nick is a middle school student who has enjoyed performing in several Pumpkin productions. A true Renaissance Man, when Nick isn’t on stage, you can find him playing his ukulele at the Baltimore Farmer’s Market or whipping up recipes from Julia Child’s Mastering the Art of French Cooking. DONNA FOX (Woodswoman/Wolf Mom) Donna Fox – Donna is a teacher, actor, and occasional director in the Baltimore area. She is happy to be performing one of her favorite stories with some of her favorite friends! LILLIE KAHKONEN (Lighting Design) Lillie Kahkonen is a freelance lighting designer from the Baltimore area. Her recent lighting design credits include Peter Pan, The Drowsey Chaperone, Sister Act, and Suspects in America. STEVE SAGAN (Ranger Jones/Hiker) Originated the role of Smudge Nose in Pumpkin’s production of Girl With Diamonds in Her Eyes. He also appeared with Pumpkin as Green Dog in Go Dog. Go! and at Fells Point Corner Theatre in Heinie Goochems. JOAN WEBER (Little Red Mom/Birdwatcher/Grandma) Joan Weber has acted on local stages for many years. During the day she is a theatre teacher at St. Timothy’s School. Happy 50th, Pumpkin! Pumpkin Theatre, Baltimore’s oldest operating children’s theatre is thrilled to be celebrating its 50th Anniversary. Come join us this spring as we partner with Single Carrot Theatre in presenting the world premiere of Little Red! In this adaptation of the beloved fairytale, the Wolf is a young pup who forgets his mother’s warnings to stay off of the forest path. 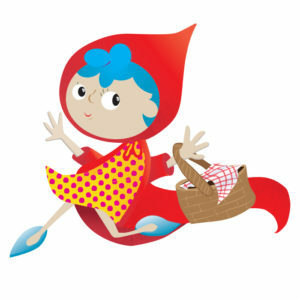 Meanwhile Little Red, on her way to Grandma’s house gets swept up in adventures with some fascinating characters. Fate brings Wolf and Red together where their hijinks get them both in trouble! Little Red was written by Stevenson University teacher Linda Chambers and is directed by Artistic Director Raine Bode, with costumes and set by Center Stage’s Wil Crowther, lighting design by Lillie Kahkonen. The cast includes Pumpkin Theatre favorites: Sofia Alvarez, Nick Dimitriades, Donna Fox, and Joan Weber. Pumpkin Theatre’s mission is to entertain, educate, and empower young children with our theatrical productions and education programs. Our plays are geared toward families with children 3 to 9 years of age. We have performed all over the Baltimore area through the years. This year we are celebrating our 50th anniversary at Baltimore’s Single Carrot Theatre! This innovative company has been entertaining Baltimore audiences for 11 seasons and we are honored to partner with them with this production.